Articulate Education UK: ARTiculate Bulletin 28.9.15: Black Dog by Levi Pinfold, Book a free workshop. ARTiculate Bulletin 28.9.15: Black Dog by Levi Pinfold, Book a free workshop. 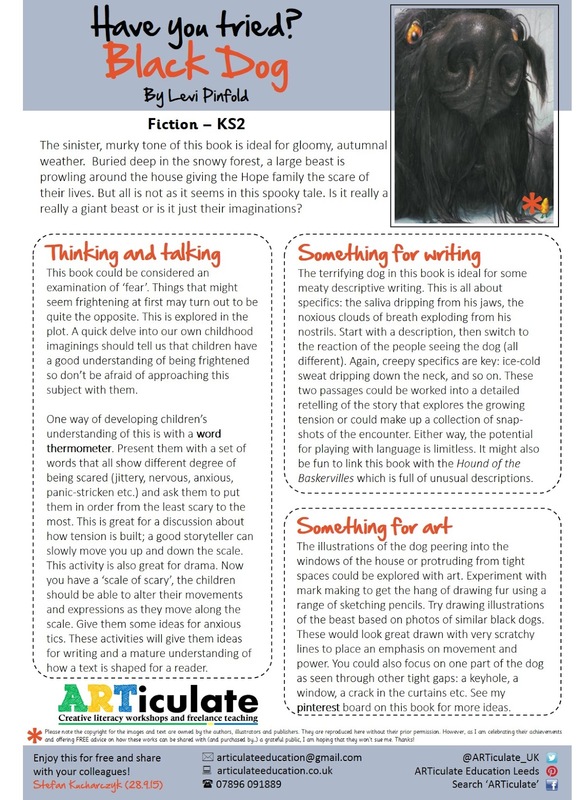 This week's bulletin features creative ideas for Black Dog by Levi Pinfold. This spooky tale has lots of unnerving qualities: Victorian sepia photos, objects that seem to move around from picture to picture and , oh yeah, a huge slathering hound on the prowl. Perfect for murky autumnal weather. If you try any of the ideas I'd love to see the work your children produce. The sinister, murky tone of this book is ideal for gloomy, autumnal weather. Buried deep in the snowy forest, a large beast is prowling around the house giving the Hope family the scare of their lives. But all is not as it seems in this spooky tale. Is it really a really a giant beast or is it just their imaginations? 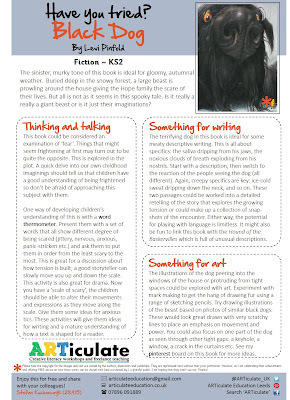 Ideas for talking and thinking: Discuss the concept of fear, develop a range of suitable vocabulary and incorporate it into your drama lessons. Ideas for writing: A perfect opportunity for some grisly specifics describing the black dog and shaping it into a new retelling of the story. Ideas for art: Use scratchy lines to draw frightening beasts and then frame them with a keyhole or chink in the curtains. This half term I am offering FREE creative literacy taster workshops to primary schools in Leeds. If you want to get a slot for your school, email articulateeducation@gmail.com (or click here) and send me your details. Places are limited so please get in quick! Not on the mailing list? To join simply click here and send me a blank email with the word 'subscribe' as the subject.